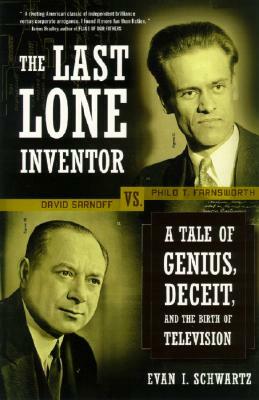 To write THE LAST LONE INVENTOR, Evan I. Schwartz spent two years researching the life stories of Philo T. Farnsworth and David Sarnoff. He interviewed surviving Farnsworth family members, including Farnsworth's 93-year-old widow, and he visited document archives in six states. As a journalist, Evan has been covering information technology for 15 years. He is a former editor at BusinessWeek, where he covered software and digital media and was part of teams that produced 12 cover stories and won a National Magazine Award and a Computer Press Award. In recent years, he has written for The New York Times, WIRED, and MIT's Technology Review. Evan's first book, titled WEBONOMICS, published by Broadway Books, a division of Random House, has ranked as Amazon.com's #1 bestselling business book and was chosen as a finalist for two major awards: The Global Business Book Award as well as the Computer Press Award. International editions have been published in eight countries. Evan's second book, DIGITAL DARWINISM, from the same publisher, also hit #1 on Amazon's business list shortly after its release, in June 1999. Now in its twelfth hardcover and first paperback printing in the U.S., it is available in the U.K., from Penguin, and has been translated into eight other languages. It too was named a finalist for the Computer Press Award for Non-Fiction Book of the Year. Evan holds a B.S. in computer science from Union College in Schenectady, New York, and lives with his family in Brookline, Mass.